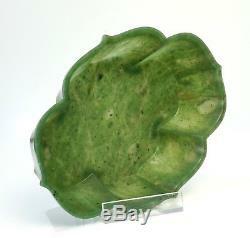 Spinach green jade bowl with foliate rim , the jade of semi translucent quality with mineral veins and darker inclusions; comes with. From the collection of Mr.
Efrain Wong, Chinese-Peruvian by repute. Efrain Wong ancestors emigrated to Peru in the early 20th century, together with more than 100 thousand Chinese immigrants who primarily worked in the cotton and sugar plantations along the Peruvian coast. Wong made his fortune in Peru by establishing the Wong supermarkets. Some fissures which are related to the natural mineral veins on the jade, one end of the fissure infilled, about 3 mm. The dish in very stable condition and emits a resonant sound when strucked. Certificate of Authenticity: Can be provided if requested. The item must be sent back within 14 calendar days. Please do not hesitate to contact me. 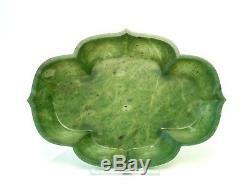 The item "Fine Provenance Chinese Jade Dish 19th Century" is in sale since Tuesday, October 2, 2018. 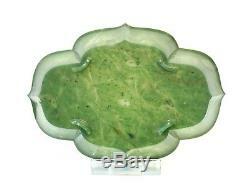 This item is in the category "Antiques\Asian/Oriental Antiques\Chinese\Bowls". The seller is "proto-cultures-art" and is located in London. This item can be shipped worldwide.